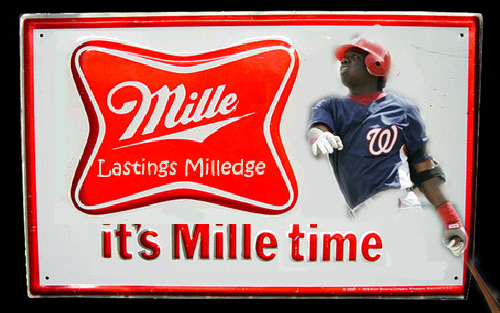 I'm not even going to start speculating until closer to draft time and knowing where the Nats are going to be. It just all crystal ball prophecies that definitely can lead to disappointment and with the Nats, I don't need anymore disappointment. What do you think the chances are of Martis finishing with a devilish 6.66 ERA tonight? Perfect pitch to K Hanley. Nice homer by Zimmy and Martis isnt looking to bad after the shot to Willingham, 4 Ks in a row. I can't stand MASN and their stupid behind the plate camera views during live play. Finally, the Marlins are playing how they play against everyone else except for us. Great patience by Elijah battling back from a 1-2 count to draw the walk. figures. Boone lines into a DP on one pitch. Stupid as hell this team is. damn, He beat that out. Martis knows how to hit. That's refreshing to see. yeah it looked like he was safe. bogus. Martis is settling down nicely. is the chase for the #1 pick nearly over? anderson hernandez and alberto gonzalez are really swinging the bats well since coming over. anyone see marrero is already taking grounders and is getting better by the days. the original thought was he wouldn't be back until spring. Milledge: 59 RBIs in 508 ABs. Flores: 59 RBIs in 301 ABs.